Bananas have been the forbidden fruit on boats of any kind (especially fishing charters) for many years. Personally I never understood it. My father brought bananas with us every time we went out and never thought twice about it. I watched him crush fish consistently and make it back to the dock every time after eating a banana for breakfast and lunch while we dove and speared fish all day. In the Coast guard we brought bananas with us in weather conditions that defy my description on nights that I truly thought I was not going to make it home, never had an issue, they sure were tasty and kept us going through all odds. I decided to write My piece about bananas with the years I have on the water and some of the things I have seen or in this case – not seen when it comes to the impending doom that bananas are supposed to deliver. then we will talk about the lore. Major League Hall of Fame Baseball player Wade Boggs and Capt. Matt Bellinger on the bow of my Lake and Bay flats fishing boat defying the banana for the win. It was in the fall one year a while back I was getting my boat prepped at the dock for a group fishing charter we had set up here at Dream Catcher Charters. Island Genn of The Keys To Key West had booked a large fishing group in a multi boat charter that had some high end executives from a well known beer distributor. As I was getting prepped the anglers started showing up and naturally started to chose their boats in pairs. I was fishing a Lake and Bay flats boat back them and the guide next to me on the dock was in a ActionCraft I think. As the anglers were making their way to our boats and had their drinks and snacks in hand ready to hand off to us to put in our coolers. Typical chit chat ensued about the day and everyones excpectaions, hopes and dreams. All of a sudden the morning air and chit chat was split wide open when I heard the fishing guide next to me raise all kinds of hell. He Yelled very loudly and said “You won’t be bringing those bananas on MY f&$%*%g boat”. The angler stopped and had a look of horror on his face. I just stood there in disbelief trying to absorb what was happening and putting together in my mind how this was going to play out. Surveying the aftermath I was looking quickly to see if anyone was offended. One thing was damn sure, that fishing guide was not going to take that angler and his bananas fishing. So quick thinking prevailed. Quickly and quietly I asked my anglers if they were packing “naners”. They were not.. I somehow called an audible and quickly switched anglers. Welcoming the VP on my boat with his potassium laden fruits and to go fishing with me. Crisis averted. There were a ton of things that went wrong in the above scenario outside the bananas thing and that fishing guide. Just so you know he no longer fishes here in Key West and as of that day, that was his last trip he ran for our overflow. Keep in mind, it wasn’t for his not wanting bananas on his boat, it’s how he handled it. First off, the tone was rude and not a great way to start the day. Second, the angler was the VP of this very distinguished company not that anyone should ever be spoken to like that. Third, its a Superstition that no one has yet to prove logical or factual. He made himself a jackass and almost offended everyone. It was tournament day. I was fishing with Hall of Fame Baseball player Wade Boggs in a Redbone Slam event here in Key West. Wade and I fished many tournaments together and this one was no different. We were competing flats fishing on my Lake and Bay Flats boat. In the morning we have to check in with the tournament committee to ensure we all depart at the same time, gather our provided lunches and snacks, sign out and make note of the score board. Being early to this part of the event was essential to me for the blue berry muffins, black coffee and orange juice. This was also a time to meet and greet the other anglers that were fishing the tournament. As everyone was milling about and I completed stuffing my face with pastries it was time to get our lunches for the day of fishing and head on down to the boat. Focus it touch first thing in the 6:30 morning but there was enough light to see as I approached my boat I saw what was considered the kiss of death. Someone had taken the time to put a banana in every one of my rod holders. Pausing for only a minute to slowly look around and see a guilty face I started accepting it. I was punked – christened with the bad luck of the banana by another angler. Looking around a little I decided that I was going to roll with it. As Wade and my second angler Matt Bellinger showed up we all looked over the scene and decided we would wear it proudly and fish the tournament without protest or problem. It was very empowering leaving the dock with the rest of the field of anglers and guides with bananas in my rod holders. It was kind of like a show of defiance. I am glad we did it. I’m pretty sure that the culprit was Marc Cooper . 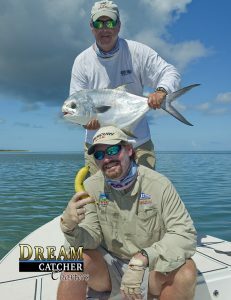 As a celebrity anglers Mark and Wade are super competitive. Both being professional ball players these guys know how to rattle each other with superstitions. These two were competing for the celebrity division in this contest and Marc was hoping that it would cause us bad luck in our fishing to have bananas. Mark Cooper has yet to fully confess to this as of this writing, in his words “I Plead the 5th”. It was apparent throughout the day that we were not going to suffer from the bad luck that bananas could potentially offer us. I don’t recall what our actual score was for the tournament but Wade did very well and captured the celebrity grand champion award. We also went all the way out and back without breaking a thing. Now I am not saying any of this stuff is true. There are way too many stories to confirm any of it to be one particular thing. But this is what I have been told and have heard around the circles I have been in..
One of the legends that I like to tell about the banana thing is about the banana boat. The story goes that as one of the biggest exports of the Caribbean islands back in the day were bananas. Now truth be told they never shipped bananas on a boat with other fruits as the gas Bananas kick off as they ripen will speed the ripening of the other fruits. So, banana boats were just that – full of bananas. According to legend there are cases where these banana boats had been found drifting not under command as the crew of the boat was all dead. Now, how did the die? Who the hell knows. I have heard Spiders, snakes, disease. Some of the stories have a certain “banana” spider carrying the weight of all the bad luck. The actual banana spider is getting bad press here because he is actually quite harmless. Could it have been snakes? Seeing as these boats were pretty large and had to have a crew of at least 8 or so (guessing). It would seem to me that if one or a few of the crew saw signs that one of his buddies had been hit by a snake, or anything down below in the banana hold, that no one is that dumb to go investigate it after say 2 or three of his buddies are dead. Unless of course he is a teenage girl in a bad 80s horror film that just heard a weird sound in the basement. Disease might do the trick. Maybe there was some fast acting disease that killed off the crew and cause these banana boats to just drift about in the vast ocean. I will go with that from here on. There is NO FACT that bananas are bad on a boat. Because of all the fake news around I have become the guy who likes to look stuff up these days. My search was “Bananas Bad Luck On Boats” A pretty cool article from Snopes.com came up and did a nice job of dealing with the myth of Bananas On The Boat. There is VOODOO in fishing. I am amazed the amount of it that I see, even in my own crew. Heres the thing, I was not brought up to be a sports guy, well actually I sucked at most sports so I didn’t like them. I never knew about the incredible superstitions or as I like to call them “StupidStitions” of guys in sports. Socks, Pajamas, a certain kind of beer its actually incredible if you look it up how much there is out there. After fishing with Wade Boggs for years I learned that Fried Chicken was his thing as well as Miller Lite. He carried that into his fishing. Obviously from the photo above, Wade has no issue with bananas on his boat. But back to Voo Doo, there is a ton of it. I plan on witing an article about all the forms of VOODOO and Fishing superstitions and I will link it here when I am done with it. So, all in all. I think people are safe with bananas on the boat. In my 32 years as a boat captain, 27 years as a professional fishing guide I can say, without a doubt that bananas are better for you than they are bad. If I have a client that doesn’t want bananas to mentally affect his day, I will eat mine on the dock before we leave. Usually I already have before I meet them. Give it a try, see what happens. You might get to the point, where you may not leave the dock without them.